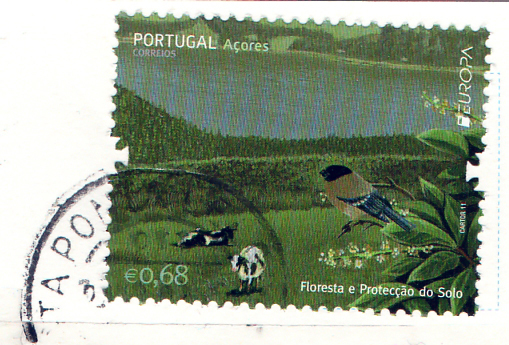 I did a talk today in Portugal covering the nine decades since Fleming discovered the effects of Penicillium sp. in 1928. I thought it would be interesting to have two endings to the talk: an upbeat one, and a doomsday one. Most of us know that Portugal is facing a dual threat: high rates of antibiotic-resistant bacteria and financial difficulties. This results in a vicious cycle: there’s no money to address antibiotic resistance, so transmission continues unabated and the antibiotic resistance problem gets worse. You can understand the dilemma from the hospital administrators’ viewpoint: I met an intensivist who confessed that “some days we don’t have any needles”. In this situation, is it better to buy some needles or invest in another infection preventionist? I recently attended a national infection control meeting in Portugal, where I participated in a forum on “International experiences with HCAI”. You can download my slides here. MRSA first emerged as a problem in the 1980s in Europe. It became a major problem in many European countries in the 1990s and 2000s so that recent data from ECDC shows high rates of meticillin resistance in S. aureus invasive isolates, especially in some southern European countries; the contrast between the rate of MRSA in the UK and Portugal is stark. 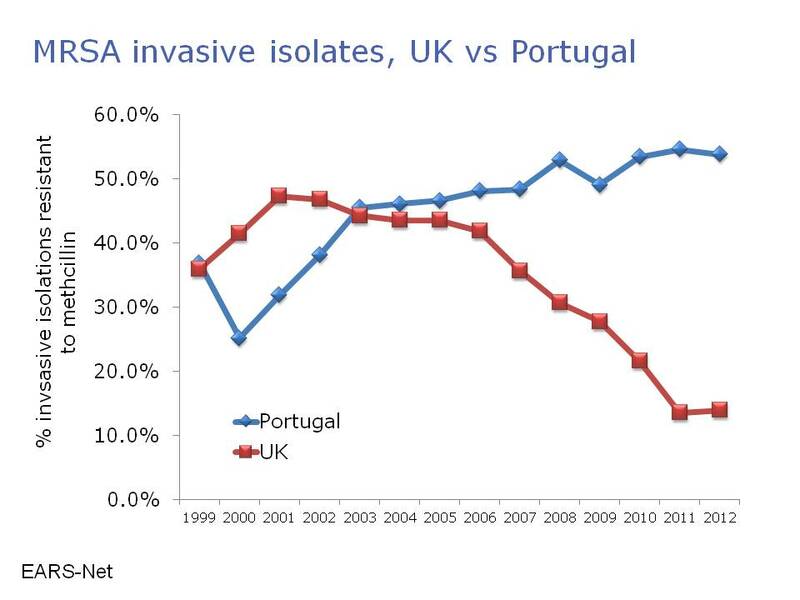 In the early 2000s, the rate of MRSA was higher in the UK than in Portugal whereas now, it is much lower in the UK (Figure 1). Figure 1: Rates of meticillin-resistance in invasive S. aureus in the UK and Portugal. Data from EARS-Net. Greece, Italy and Portugal are especially affected, with 25 to >50% of invasive S. aureus isolates resistant to methicillin. In the UK, a national strategy has yielded a dramatic reduction in the number of MRSA bloodstream isolates reported to the government in a mandatory reporting scheme (Figure 2). 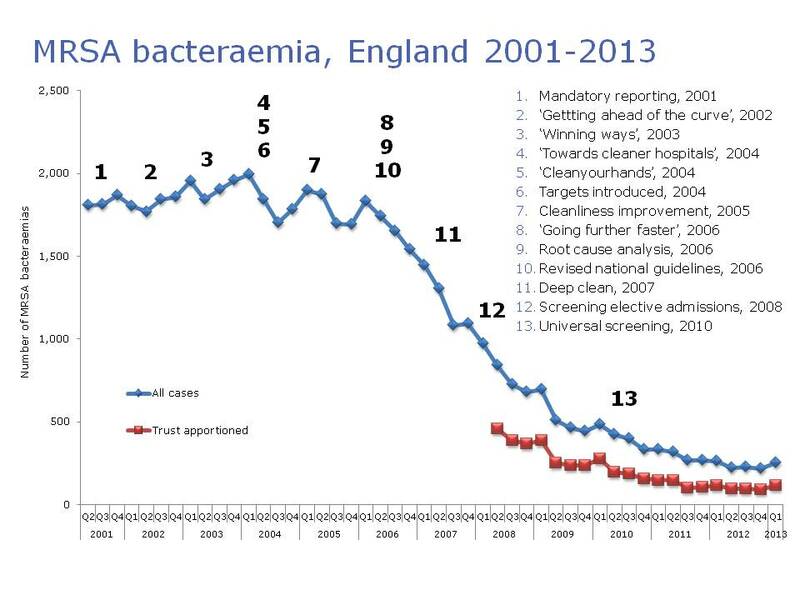 Figure 2: Dramatic reductions in MRSA bacteraemia in England. But what has made the difference? Since the national intervention in England was multifactorial, it is not clear what made the most impact, and it seems likely that more than one intervention contributed to the decline. Interventions included increased attention to intravenous line care, cleaning and disinfection of the environment, improved diagnostics (including the introduction of chromeagar and rapid PCR) and a national hand hygiene campaign. Perhaps the single most important intervention was the introduction of MRSA reduction targets, which were very controversial at the time, but put the issue of MRSA higher on the priority list for the hospital administration. And this issue is not restricted to MRSA. In fact, the threat of the resistant Gram-negatives is even greater than MRSA in many ways. Carbapenem-resistant Enterobacteriaceae are rare currently in Portugal, accounting for 1-5% of invasive K. pneumoniae isolates. However, you get the feeling that it’s only a matter of time: carbapenem-resistant Acinetobacter baumannii are now endemic on many Portugese ICUs, and carbapenem use in Portugal is some of the highest in Europe, with >45% of patients on an antibiotic and >5% of patients on a carbapenem according to the ECDC point prevalence survey. 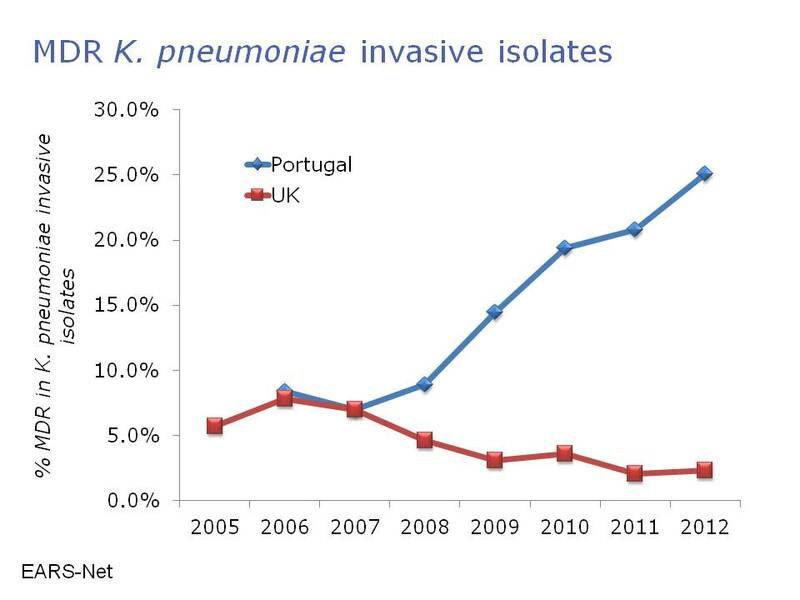 Indeed, there has been a disturbing increase in multidrug-resistant K. pneumoniae in Portugal in recent years (Figure 3). Figure 3: Disturbing emergence of multidrug-resistant Klebsiella pneumoniae in Portugal. Data from EARS-Net. The reason for these differences between the UK and Portugal is not clear, but may include infection control staffing, antibiotic usage and lower prioritisation by hospitals. Some progress is being made in Portugal with the recent launch of a national strategy to control healthcare-associated infection. However, the financial climate and somewhat fragmented healthcare system (compared with the NHS) will make implementation challenging. But at least it’s a start.